Roberto Salvarezza delivered a speech about the boost that the technology transfer system has received in recent years during the opening of Nanomercosur 2013. During the meeting, that took place in Buenos Aires from 12th to 14th November, the president of the National Scientific and Technical Research Council (CONICET), Roberto Salvarezza, spoke about the current situation of the Council and the challenges in terms of knowledge transfer. 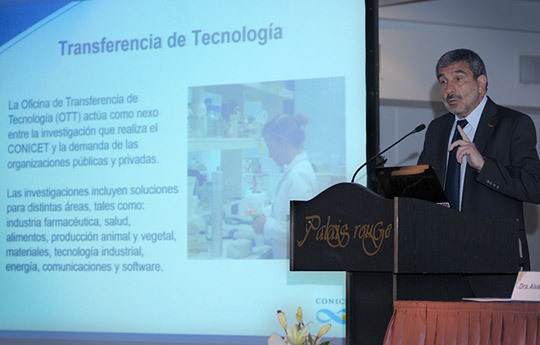 After presenting the figures of the CONICET, its organization with centres all over the country and its national and international cooperation activities, Salvarezza explained that “when we talk about knowledge transfer, we are not only speaking about value assets or technology transfer to companies, but also about social sciences and health, for instance about translational medicine projects, to name some”. CONICET ranks first in Argentina and second in Latin America, after the University of Sao Paulo, in terms of scientific production and quality. Regarding that, Salvarezza asked the audience to reflect upon the role of Argentina, which according to a report of the Scientific American magazine ranks 31 in the Global Science Scorecard, based on the number of academic papers in a select group of journals. “The challenge of CONICET and of all research institutions in Argentina is to analyse different ways to appropriate the knowledge we generate, and then transfer it”. “Traditionally, we have been working on the questions researchers pose; but now it is time for other actors – such as the society and the State – to pose those questions, because they have to face different challenges”, he concluded. Throughout the conference, he presented the work of the Technology Transfer Office in terms of intellectual property, number of patents by year, agreements and High Level Technological Services. The aim was to show all the services CONICET provides and how they benefit companies by improving their products’ quality and help them solve technology problems. Salvarezza remarked that “during 2012, CONICET provided 10.000 services to 1.000 contracting parties – and 63 per cent of them are national SMEs”. At the end of his talk, he affirmed that “we are aware that our Argentine scientific system is able to produce quality science and our challenge is to transfer knowledge that may have an impact both on the economy of the country and the quality of life of the population”. CONICET was present in this exhibition with an institutional booth and the participation of seven research institutes from different parts of the country. Nanomercosur 2013 “Nanotechnology for industrial competitiveness” was organized by the Argentine Nanotechnology Foundation (FAN) that is under the scope of the Ministry of Science, Technology and Productive Innovation. This event brings together researchers, technologists and entrepreneurs of the Latin American and European nanotechnology sector and it holds conferences by experts of Argentina, Brazil, Uruguay, Colombia, Spain, Portugal, Italy and the United States.